Zara Floral Pants first appeared on Chictopia's streetstyle gallery in Summer 2012 seen on Los Angeles blogger mybelonging of mybelonging.com. He styled his white Zara floral pants with a black 3.1 Phillip Lim mesh boots, black Balmain blazer, and gray Louis Vuitton damier bag. Since then, Zara Floral Pants have grown in popularity as bloggers from Los Angeles, KATOWICE, and Ciudad De México have discovered them. 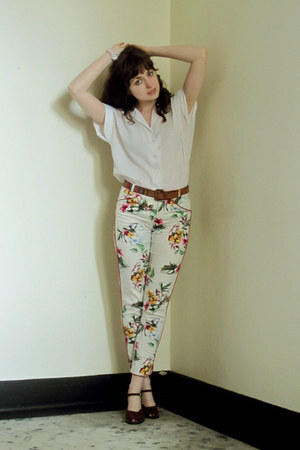 Zara Floral Pants are generally seen in chic, trendy, and natural style. Popular types of Zara Pants are leather pants, pants, skinny, faux leather, and harem. 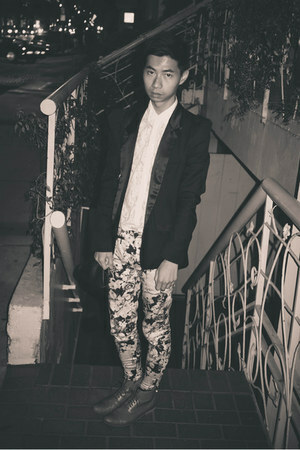 There are currently 40 streetstyle photos of bloggers wearing Zara Floral Pants. Most recently, blogger mybelonging of mybelonging.com wore his white Zara floral pants with a black Steve Madden pony hair shoes and black steven alan willard sunglasses. I just love them. They fits me perfect and I am very satisfied. Zara are my favourite brand for pants !